Why should sovereign states obey international law? What compels them to owe allegiance to a higher set of rules when each country is its own law of the land? What is the basis of their obligations to each other? Conventional wisdom suggests that countries are too different from one another culturally to follow laws out of mere loyalty to each other or a set of shared moral values. Surely, the prevailing view holds, countries act simply out of self-interest, and they eventually consent to norms of international law to regulate matters of common interest.In this groundbreaking book, Fernando Tes�oes against this prevailing thought by arguing, in the Kantian tradition, that a shared respect for individual human rights underpins not just the obligation countries feel to follow international law but also international laws themselves and even the very legitimacy of nations in the eyes of the international community. Tes�both a lawyer and a philosopher, proposes that an overlapping respect for human rights has created a moral common ground among the countries of the world; and moreover, that such an outlook is the only one that is rationally defensible. It is this common set of values rather than self-interest that ultimately provides legitimacy to international law. Using the tools of moral philosophy, Tes�nalyzes the concepts of sovereignty, intervention, and national interest; the contributions of social contact theory, game theory, and feminist theory; and the puzzles of self-determination and group rights.More than simply outlining his theory, Tes�oes on to give detailed examples of international laws, international institutions, and their human rights foundations, putting his ideas to work and addressing legal reforms called for by the theory. He suggests that treaties, for example, should be considered binding if, and only if, the consent to the treaty was given by a genuinely representative government, one that acts out of interest for the human rights of its citizens. 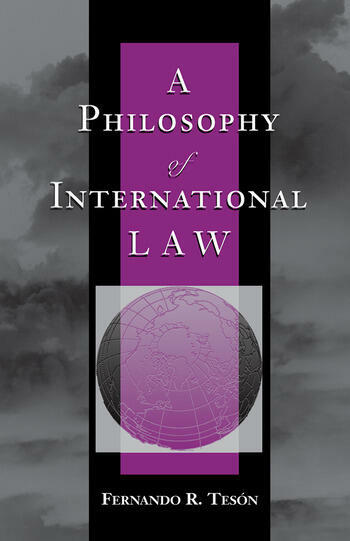 Although the theoretical achievement of this book is to challenge received wisdom on the foundation of international law, the practical ambition is a call to reform the international legal system for the post?Cold War era, to substitute for the old order one that gives primacy to human dignity and freedom over state power.